The UHD Center for Teaching and Learning Excellence (CTLE) announces that eight faculty members have been selected as recipients of their Online Learning Consortium Online Teaching Certification Professional Development Grant Program for the 2017-2018 academic year. The basic certification program includes a 10-week long foundations course and three elective workshops based on the participant's interests and needs. The courses are all delivered online. Faculty become students in online courses where their fellow classmates are college and university instructors from around the world. This first-level certification prepares educators to teach and improve online courses using the OLC pillars of quality in online education—learning effectiveness, scale, faculty and student satisfaction, and access. A unique feature of the program is that expert mentors work individually with each certificate candidate to accomplish specific goals. The program culminates in a capstone presentation where the participant demonstrates what was learned and incorporated into courses at the participant's home institution. "I am thankful to CTLE for this opportunity because seeing students succeed is the main joy of engaged faculty," remarked Professor Dietrich von Biedenfeld. "The CTLE team ensured that we learned a great deal in the certification course, and I'm especially excited about applying best practices in online content delivery to our own online courses here in the Marilyn Davies College of Business." "I've taught online for 10 years, because I love the flexibility of online education, and the opportunity it provides me to reach students who can't attend a traditional classroom," said Stephanie Babb. "I've completed Quality Matters trainings and participated in a teaching circle grant, but I'm looking forward to the opportunity to really examine my most frequently taught online classes, and improve students' engagement with the course materials, as well as with their peers and myself." For faculty who have already completed the traditional certificate program or have been teaching online courses for a longer period, OLC's advanced certification is a 12-week long program of study consisting of 6 units. Participants begin with a course design review of a course they are currently teaching to identify strengths are areas for improvement. They also broaden their knowledge of various formative and summative assessment techniques, examining course learning objectives to ensure they are measurable. Participants then explore active learning techniques, multimedia, social media, and accessibility considerations in online teaching and learning. The program concludes with an "open unit" during which participants explore a topic of their choosing, followed by a reflection on all course improvements made using OLC rubrics and quality standards. "This year's participants in OLC's certification program bring the total number of UHD faculty with this unique distinction to 30. This is a major feather in UHD's cap and clear evidence that we are not only making significant strides in improving online education at the University, but also that UHD stands out on local, regional, and national levels in terms of how much our faculty care about crafting quality online experiences for their learners," noted Georges Detiveaux, assistant director of the CTLE. "What's more, our online instructors who avail themselves of CTLE services are light years ahead of any of our neighbors. 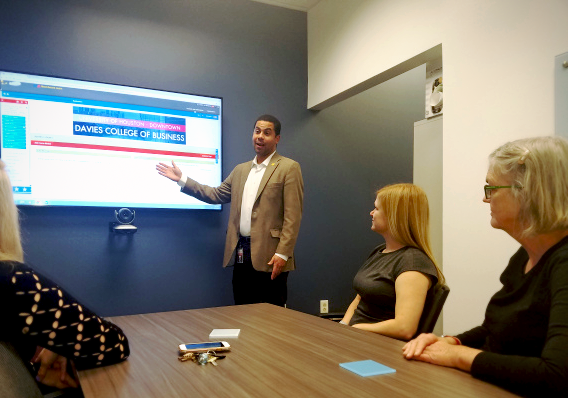 UHD has more faculty with OLC certification than their counterparts at any other colleges or universities in Greater Houston, which is really something of which we, as an institution, should be very proud." Through this initiative, CTLE covers registration and pays each faculty member a stipend for completion of what amounts to the equivalent of two graduate courses in online teaching and course design. The call for applications is sent out each fall, after which participants for the coming year are chosen, notified, and enrolled. For more information on OLC certification, and additional resources and support offered to new and continuing hybrid and online faculty, contact the CTLE at ctle@uhd.edu, or visit www.uhd.edu/ctle.